Azurea is an American sage fairly well known in Australia. It is a very pretty heavenly mid blue with canes about 1.5m high. 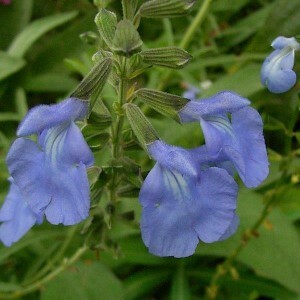 However it does not have its flowers until late summer and by then it is usually flopping. Some people tie it up or let it flop if there is room. Shortening the plant by half about December will have it flower shorter on more sturdy stems. Lambley Perennials had a long wide walk bordered with azurea (in 2014) and let it flop and look very pretty. I had a white azurea at one time and hope to have it again in a year or so. Grow in well drained sun . Azurea is winter dormant when stems can be cut out after harvesting seed. It can also be propagated by cuttings or division.